Bansuri Flute of India. Instructional DVD. With Lecture Demonstration of Indian Classical Music. Flute Tonic : A. Key : E. Bass. Tutorials of this DVD, is based on 7 Finger Holes Flute. Bonus Limited Edition Concert DVD. Sachdev - Swapan. A Night in Berkley. Live at St. John's. 2002. Raga Mishra Kafi : Medium Rupak Tala and Fast Teentala. Raga Vihag : Medium Teentala. Folk Dhun : Kerva Tala. 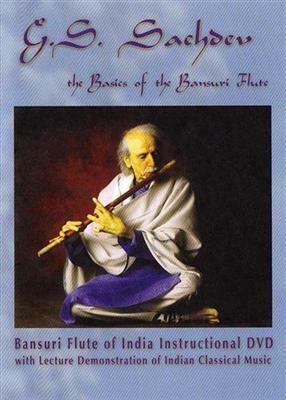 The Basics of the Bansuri Flute. A Night in Berkley. Live. Part 1. A Night in Berkley. Live. Part 2. A Jeff Whittier Flute. 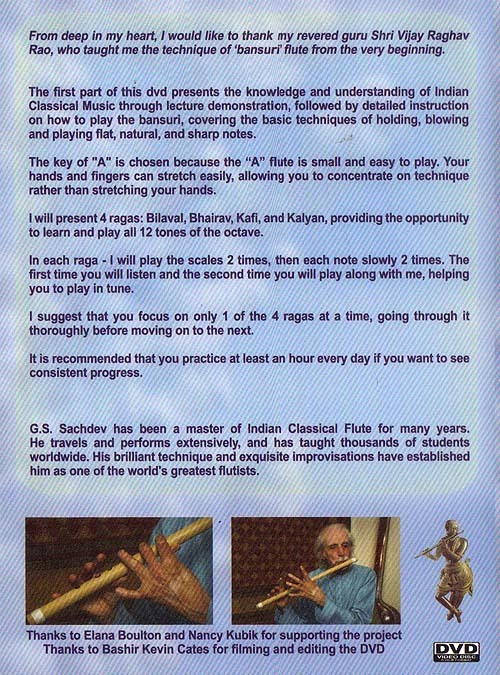 A. E. Bass is played by Pandit G. S. Sachdev in the Tutorials of Instructional DVD. A Jeff Whittier Flute. F. C. Bass is played by Pandit G. S. Sachdev in the Live Concert DVD. Kirti : I have worked my way through the Pandit G. S. Sachdev video over the last day or two and you have to let people know that this is the absolute best they can possibly buy. The instruction is clear and the photography absolutely perfect clean, clear and crisp, the best quality I have ever seen. So far as flutes are concerned, Sachdev's style is very astute, in that he concentrates on the mid to upper octaves so I would suspect even the tonic F's are narrow bore as the 4 Hole Model. Pandit G. S. Sachdev - Biography. Pandit G. S. Sachdev, began playing the Bansuri when he was 14, and has created a rare form of instant communication with audiences through his music. Unlike many musicians, he has shied away from fusion, finding great pleasure and a sense of immense satisfaction with the rigors of infinite exploration within traditional pure classical Indian music. Beyond his world wide live performances, Sachde's music is thoroughly enjoyed in yoga studios, meditation ashrams, massage rooms, spiritual centers and homes everywhere imaginable. Sachdev's Music is considered an antidote to Stress, Fatigue and Cynicism. Sachdev's frequent world tours and recordings have won him many laurels and made him an internationally renowned legend respected by musicians and audiences in all realms of world music today. "We are fortunate to have such a fine musician as GS Sachdev in our presence"
"I admire his ability to touch the spirit of the raga he performs and also to move the listeners emotionally with his pure and classical approach"
"... haunting performance ... the sound of his flute rings with an indescribable purity"
"Sachdev's playing is the most sensitive I have ever heard. The metal flute is just not capable of the subtleties and nuances produced by the Bamboo flute. It is truly transcendental music"
"Sachdev's natural simplicity and crystal clarity transcends all boundaries of technique and form. He caresses your mind with the sweet voice of his flute, leading you into worlds of ultimate pleasure, beauty and peace"
"Awarded Shiromani Sangeetkar of 2008"
- By Government of Punjab, India.